There are four exercises that you do for 50 seconds and rest for 10. You’ll do three rounds of each. Don’t worry if you can’t get a lot of reps in, just keep moving! The third round really caught up to me, but I powered through. Good luck! Its been a while since I’ve blogged! That happens when the hubster comes home from Afghanistan. We’ve been going 90-nothing every day. We are both going to the gym every morning and yesterday’s upper body routine still has me sore, but I wanted to put our kettlebell routine from today on here. I’ve posted it before, but I love it…full body workout in not a lot of time! Tabata: 20 seconds on, 10 second rest, 8x Usually, you’ll do this with at least four exercises. We only did two today, but ouch. Warm-up: Treadmill, speed 4.0, incline 3.0, time 10 min. With my arms, I focused on triceps and shoulders, with a little biceps thrown in since the kettlebell workout already worked my back. As always, modify to your fitness level. Not everyone can do all of this in one day. I have definitely found my motivation for the gym again. This week, I’ve been doing a quick warm-up on the cardio equipment, then using different quick workouts for a more extensive warm-up, then lifting. Today I did the jump rope and ab routine I told yall about a couple weeks ago, then worked my back and shoulders. Here’s the work out. Warm-up: 10 min on stair climber. Always modify to your fitness level. The first part of the workout is enough for a beginner, do your weights on a different day. I loved my workout today! As always, modify to your abilities. 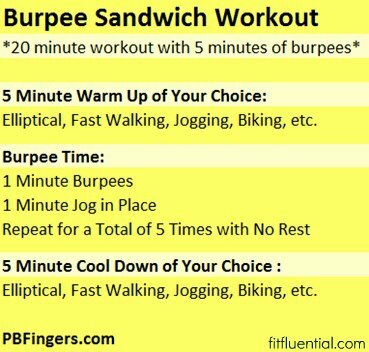 If you can only do the burpees at the beginning, that’s ok. Its a killer workout and it only takes 10 minutes! !